Cori Salchert, fosters and adopts “hospice babies” whose own families find it too hard to cope with their child’s terminal diagnosis. She is the mother of over fifteen children, some of whom died in her care. Cori traveled a very painful pathway before she arrived at her calling to caring for and loving terminally ill children so that they will not die alone. 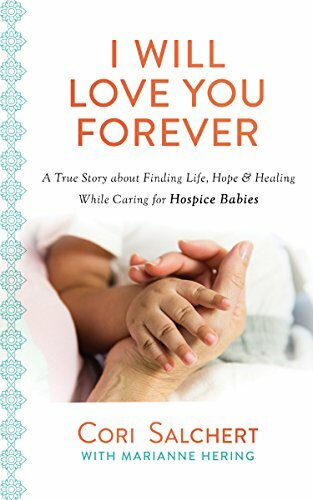 Cori shares her journey into this calling in her book, I Will Love You Forever, A True Story about Finding Life, Hope & Healing While Caring for Hospice Babies. She calls her home a “house of hope” where she and her family dedicate their lives to providing dying children with loving hospice care until the end of their lives. In this moving conversation, Cori shares with Sharon Betters how God used her years of undiagnosed pain and illness to help equip her to recognize the value of every human being, no matter how “unproductive” others might view them. Her first hospice baby was Emmalynn, a baby born missing part of her brain. Instead of dying in a hospital, during her last days of life, Emmalyn was surrounded and snuggled by people who loved her. Cori says, “Emmalyn didn’t suffer, she wasn’t in pain, and most certainly wasn’t alone…What a gift it is to be a part of these babies’ lives, to cherish and love them even though they aren’t able to give anything back. No matter your season of life or daily responsibilities, Cori’s story will inspire and encourage you to recognize you, too, have the privilege of offering help and hope through your everyday life. Cori Sachert is the mother of fifteen kiddos and counting. She knows what it is like to love deeply while holding loosely to the terminally ill children she cherishes in her home for the brief time they live before dying Her strength and hope are in God, and the pain and grief endured on earth is worth it because she will have forever to love her children in heaven.